I still cannot wrap around my head the tragedy that took place today in Boston. I am still speechless. 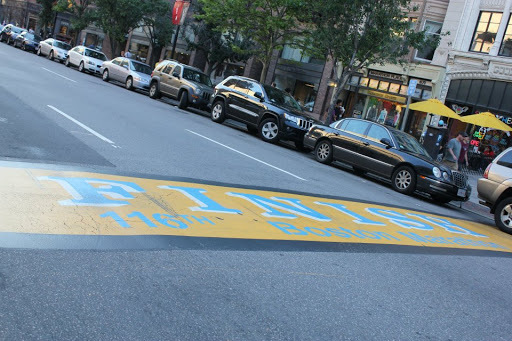 Running in the Boston Marathon is pretty much every runner’s dream. The tragedy today did NOT shatter that dream for me. It has made me even more determined to qualify for this prestigious race. One day I will cross that finish line with a huge smile on my face. Done. I am loving these 400s!! I felt really good afterwards. I ran these on the treadmill at a 7.5 speed which is an 8 minute mile. I did not run. I wanted to give my legs a rest before the half marathon on Sunday. I am thinking of going to bikram yoga on the Thursday before race day weekend. I ran 13.18 in Raleigh, NC. It was another hilly race. The course was boring too. It was a beautiful day and perfect for a race. According to my Garmin my finish time of 2:25:50. 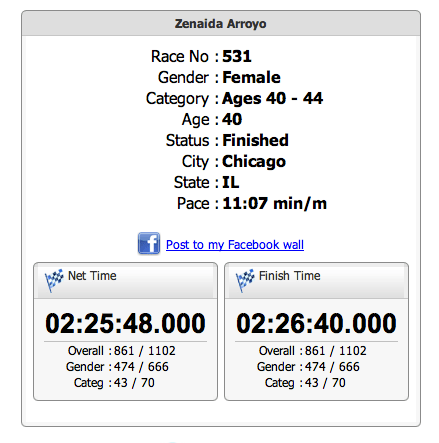 However, my official finish time from the website is 2:26:40. That makes no sense. Or does it? Total miles ran this week is 18.68.